Excellent summary Hagbard. I can't think of anything to add except maybe that the starting position always has the king in the centre, surrounded by the defenders, and the attackers always occupy the central edge squares. The position is rotationally symmetrical, and usually cruciform, but there is some room for experimentation in the placement of both attackers and defenders, particularly with the larger boards. Also, in Brandubh at Dragonheelslair, the King may be captured on two sides even when he is occupying the throne square, which is not hostile. I strongly prefer your version of Brandubh. I like Damian's equation for the ratio of pieces to board size - I guess Ard Ri is no good because it violates this principle. The king is on the centre square, surrounded by his defenders. The attackers occupy the central edge squares. The ordering is rotationally symmetrical. Yes, sounds good! This is a good general description of the Tafl family of games. It's often been claimed that game balance is not that crucial, because any size of unbalance can be overcome by always playing two games, one of each color. Reductio ad absurdum, this argument would be equally valid for a perfectly unbalanced game: white always wins and black never. Playing two games, swapping colors, would always give one win to each player. And all players would come out equally strong. Though one could call such playing fair, no one would bother to play such a dull game. Fairness lies in the swap of colors, but the fun lies in the balance! Balance alone is not enough. Fx. 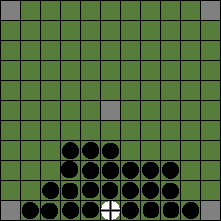 test games show that The "Old Hnefatafl 11x11", which is described on multiple sites on the internet, has about the same balance as Fetlar 11x11. However it apparently by far doesn't catch the players' interest the same way as does Fetlar. For a year the "Old Hnefatafl" was the default game of this site (aagenielsen.dk), and through that period new players disappeared as quickly as they came. Somehow the game didn't catch them. I (and other players) suspect that the fault of Old Hnefatafl is the capturing of the king next to a corner by two attackers only. This makes it annoyingly difficult to get the king to a corner, and it inhibits many of the fierce and interesting corner fights you see in Fetlar. Despite same balance, Fetlar is a catching game, and "Old Hnefatafl" apparently is not. Historical sources indicate that some tafl games (fx. tablut) have a throne (forbidden king's square in center) and others not (fx. tawlbwrdd). The adding or not adding of a throne could've been used as simply a means to balance the game, when necessary. Especially the vulnerable tablut king, captured from two sides only, is well protected in center by a throne. Some test games indicate that adding a throne can shift the balance roughly +1, i.e. if the balance without a throne is fx. -1.8, it could be +1.2 with a throne added. Test games and the internet. On this site (aagenielsen.dk) we have till now tried 83 tafl variants, with emphasis on variants described in historical sources, described in important books and articles, used in commercial releases or used in reenactment milieus. (Hat tip Damian Walker, Sten Helmfrid and others). Through test games via the internet the game balances of many variants have been measured . Till now about 600 players around the world did about 10,000 games of various tafl variants. The most accurate of the balance measurements is now based on 2800 games. For comparison, a Canadian study of variants was based on 48 games done by a few fellow students. And the archaeologist behind the Skalk variant writes that he tested his ideas in games against a few colleagues. I believe that a testing and study to the extent we're doing here, has not been done before. It's been possible thanks to the internet, since the 600 players are scattered over a large part of the world and the 10,000 games were done via the net. That was a fascinating article, Hagbard, thanks so much for taking the time to write and post it. Hagbard wrote: Test games and the internet. I am sure that is correct, that this research has never been done before in any depth; I really think we are pioneering the modern game, not just the rules and game balances, but the tactics and terminology too. Hagbard wrote: Throne or not throne.Historical sources indicate that some tafl games (fx. tablut) have a throne (forbidden king's square in center) and others not (fx. tawlbwrdd).The adding or not adding of a throne could've been used as simply a means to balance the game, when necessary. Especially the vulnerable tablut king, captured from two sides only, is well protected in center by a throne. Some test games indicate that adding a throne can shift the balance roughly +1, i.e. if the balance without a throne is fx. -1.8, it could be +1.2 with a throne added. That too is very interesting, I didn't know you were able to assign a balance value to the throne - another original piece of research! We could perhaps have a closing line stating that historical accuracy is important to us, but that playability in modern tournament settings is paramount. Also that the rule sets are under constant review and subject to development should new historical evidence come to light or if advances in strategy reveal flaws that make the game unplayable in tournaments. That's really important. In the hnefatafl world, such as it is, we are the 'modernists', in that we want the best possible game that is still hnefatafl. Hagbard wrote: The usual number of tafl game pieces is the Walker number p = 6w - 29, where p is the number of pieces and w is the width of the board in squares (hat tip: Damian Walker). crust wrote: I like Damian's equation for the ratio of pieces to board size - I guess Ard Ri is no good because it violates this principle. Interestingly, it follows from the Walker formula that there can be no 5x5 tafl board. Because a 5x5 board would use 6 * 5 - 29 = 1 piece only, that is only the king and no men. When playing a pair of games white/black & black/white simultaneously, it's theoretically possible for a lower rated player to copy all the higher rated player's moves for his own moves. To avoid any risk or suspicion of that, when playing against higher rated players I usually as a common courtesy do first the game of black lower rated player (or a good part of it) and thereafter the other one. On preventing that a game is stuck in repetitions. Repetitions were discussed at length in 2012. Here just a few comments. If repetitions were to be counted as repetitions of full board positions, and the player to lose were to be he who first entered this particular board position, then this way of counting would suit well the computer, which can easily keep track of that. For real players playing in real life, however, this would be a very inconvenient rule to handle. The king threatens to exit and a muscovit is moved in between to block. The king then moves to another square and threatens to exit here as well. The same muscovit has to be employed to block this time too. The king moves back to the first square and the muscovit is also moved back to block. When the described moves are repeated a couple of times, he who plays the Swedes must make a different move, because it is he who is the aggressive party. The "aggressive party" is always trying to break through, to find an open path, somewhere. The reacting player is always busy blocking those paths. This way of counting repetitions and deciding which player loses the game, is a bit more difficult for the computer, but is very easy to handle for real players. In some variants it is possible to place a piece on a square, where it cannot be captured; a "dead square". Somehow this feels not right. Enemies can be packed all around the piece and it is still not captured, just stuck on its sqare and immobile. A piece placed on a corner square cannot be captured. The king placed on an edge square cannot be captured. In a corner, a piece could be captured from the two neighbouring edge squares, as is the case on all other edge squares. The king could be captured on an edge square by surrounding from 3 sides. But still not on an edge square next to a corner; this is not a "dead square", since the king is not stuck and immobile there.